"It was a bold man that first ate an oyster." Located in the Heart of Hickory, Standard Oyster Company is a purveyor of fresh and seasonal seafood. Standard Oyster Company opened in April 2016. It was cultivated and brought to life by seafood enthusiasts for seafood enthusiasts. Our mission is to create a energetic dining experience that includes a vast array of oysters and fresh seafood. Our hole-in-the-wall space is inspired by our Founder's own vibe, resulting in a laid back and industrial "all bar" setting that is true to the core. Once stepping inside you're no longer in Hickory, instead an oasis of urban society. Indulge in chilled seafood platters, steamed shellfish, and other classic American fare. Our full bar highlights regional spirits, great wine, and North Carolina beers. Our raw Oyster selection rotates daily based on seasonality and availability. Expect over 8 Varieties of Raw Oysters from all over the East Coast and occasional West Coast Oysters. Call for today's offering. 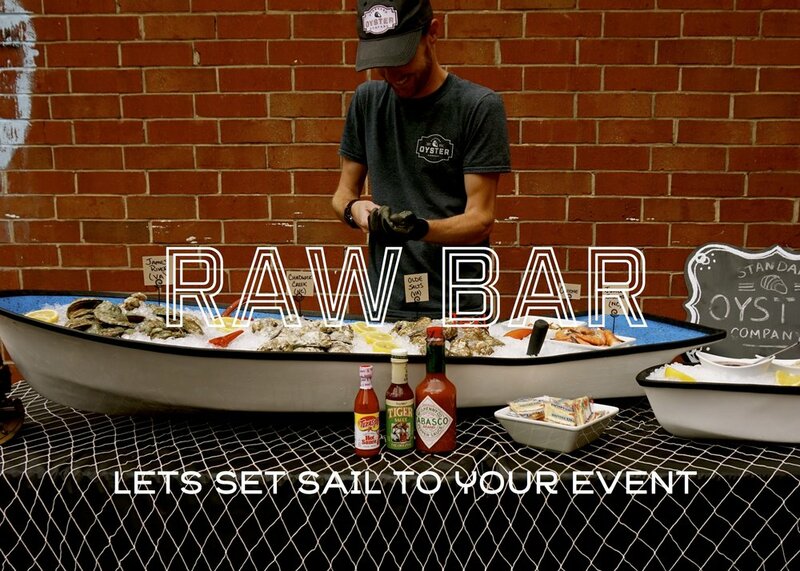 Standard Oyster Company provides unique, off-site catering options; including low country boils, crawfish boils, on-site raw bar, and custom buffet services to make your next event memorable. Call today or complete the form below for more information on our unique seafood catering experiences. Our space is available for private events daily for breakfast, lunch, & dinner. Even on Sunday. Standard Oyster is perfect for birthdays, receptions, rehearsals, pharmaceuticals, and other private parties. We can accommodate up to 52 guests. Food & beverage minimums or private rental fees may apply. Reach out to us about your Next event. We aim to reply by the close of each business day. Thank you! We aim to be in touch by the close of the day. BUCK A SHUCK. DOLLAR STEAMED OYSTERS & $3.5 DRAFT PINTS. HALF PRICE BOTTLES OF WINE. ALL WINES INCLUDED. JOIN US FROM 12-2 FOR $1 RAW NORTH CAROLINA OYSTERS. We accept a limited number of reservations in advance. Don't have a reservation? No problem, walk-ins are always welcome. For parties larger than 6, please give us a call (828-322-1705) or email (zack@standardoysterco.com).